A walk round the fields to the north of the village, taking in the recreation ground, medieval fish ponds and St Mary's Church. 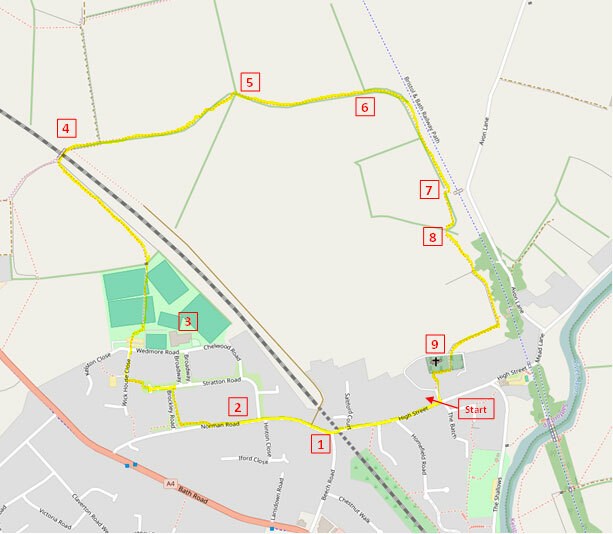 Distance: 2 miles, circular walk. Going: Easy, but can be wet or muddy after rain. Facilities: The Bird In Hand close by. Walk up the High Street, and continue straight on into Norman Road. 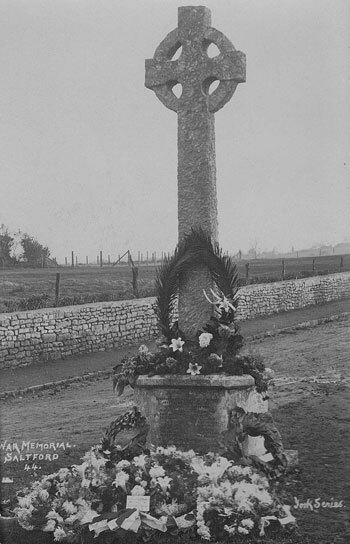 The war memorial on your left was erected in November 1920. Its original location was in the middle of the road junction between Beech Road, Norman Road and the High Street (see below & right). Just along from the current site of the war memorial (1) there used to be two wooden huts that were a butcher's shop and a cobbler's. 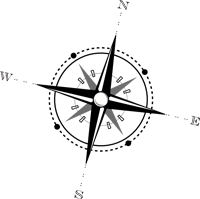 Further on, on your left, there was a small field that contained the W.I. (Women's Institute) hut. The hut was bought second hand from the Army at Codford in Wiltshire, and erected in the early 1920s. After Saltford Hall was built it was demolished in the 1960s. Continue along Norman Road past Stratton Road on your right, and you will see Saltford Community Church - a modern building set back from the road on the right (2). Norman Road was originally called Boyd Lane, but became Mission Hall Lane in the 1890s before being named Norman Road in 1928. The car park of Saltford Community Church is on the site of the 'Working Men's Hall' which was built in the 1860s by the working men of Saltford under the auspices of one Miss Geraldine Hooper, who observed that they were unable to attend the morning and afternoon services at St Mary's Church as they were busy at their work during the day. Evangelistic worship in the Hall was conducted by Miss Hooper assisted by a Mrs. Mallinson, The Hall was adjoined by the 'Hall Cottage', the building which still stands in front of you (no. 30), where Mrs Mallinson and her husband lived. After use for a period as a general village hall, the building was bought in 1892 by two Bristolians who wished to 'carry the gospel' to the people of Saltford, and it then became known as the Mission Hall. On a map of 1931 it is called the Gospel Hall, and by 1966 it is known as Saltford Evangelical Church. The old building was demolished about 15 years ago to make way for the new Evangelical Church. Continue along Norman Road and then turn right down Brockley Road. At the T junction (Stratton Road) turn left to the end and then take the footpath on the right hand side in front which takes you through to Wick House Close. Turn right and walk down to Wedmore Road, and go straight on through the car park to the recreation ground. Saltford Hall (3) was built with funding from local residents and the Ministry of Education in 1955. Stratton Road, Broadway, Wedmore Road and Chelwood Road were built in the early 1950s on the site of the original recreation ground, and it was moved a little to the north to its current site. Go slightly right across the recreation ground towards a stile on the opposite side. Cross this and then follow the railway line to the side of the next field to another stile. Cross this and turn right onto the bridge (4). This bridge - Clays Lane bridge - is a Grade II listed building, and is one of a series of near identical Tudor Gothic overbridges erected on this section of the line in time for its opening in August 1840. It is an early example of a GWR railway structure dating from the pioneering phase in national railway development. Cross the bridge and continue straight on, ignoring a footpath that goes off to the left towards a farm in the distance. As soon as you can move right into the adjacent field, and continue straight on, keeping the hedge to your left. There are nice views all round from this path. Avon Valley Farm is to your left, and a little bit to the right of it you can see the tower of St. Mary's Church, Bitton, and the village of Bitton beside it. At the end of this field the path continues over a stile and then over a little footbridge (5). As you come off the bridge keep straight on, with the hedgerow to your right. At the end of this field the path enters a thicket (6) and swings round to the right in the trees. You are now walking parallel to the Bristol and Bath railway path (below you to your left). Soon you will see an overbridge to your left leading to Avon Lane (7), but turn right here into the field and immediately left, and follow the path round and through the hedgerow into the next field. On your left, at the base of the large weeping willow tree, is a large pond (8). This medieval fish pond might have been associated with Keynsham Abbey and the production and storage of coarse fish as a food source, or it may have been directly associated with the food supply for Saltford Manor House (there were monks there at one stage), which is only a few hundred yards away. You can see the stone lining of the pond on the opposite side. In wet weather you will be able to see hoof prints of the roe dear that are resident in this area leading down to the water's edge. Just beyond and below the pond, the stream that leaves it flows through a flat area that looks as if it was man-made, and which may either be the remains of a second pond or perhaps an area to grow and harvest water cress. Old maps show a further pond lower down where the stream flows into a thicket. As you continue walking along this path there is a nice vista of St. Mary's Church, Saltford Manor, and, over to the far right, Saltford House and Tunnel House. After passing into another field the path swings round to the right and then reaches a private driveway (9). Cross over this into the churchyard and over to the stile on the opposite side onto the path. 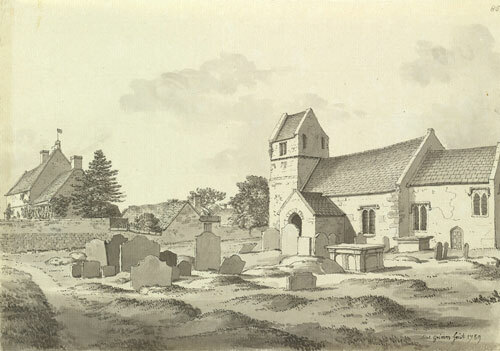 St Mary's Church, 1789, by Samuel Hieronymus Grimm. St Mary's Church in Saltford was first constructed in early Norman times (although the base of the tower is thought to be late Anglo-Saxon period) and has been altered and extended many times since then. It is well worth a visit. Details of the church and its history may be found here: History Project - St Mary's Church. 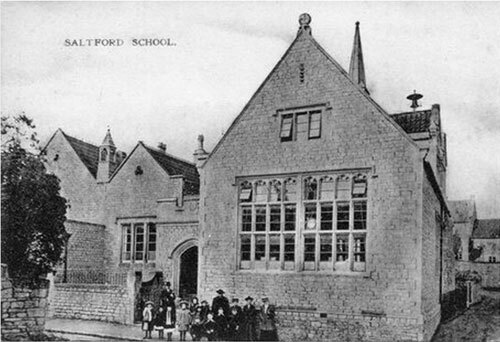 Saltford School c.1900. Originally known as Queen's School. Built in 1874 due to the generosity of Juliana Kelly. On your right is the Church Hall, formerly the village school. This was built in 1874, replacing the former school buildings. It was funded by Juliana Kelly, widow of Admiral Benedictus Kelly of Saltford House. You can read about Juliana Kelly on the Admiral Kelly page of our website. 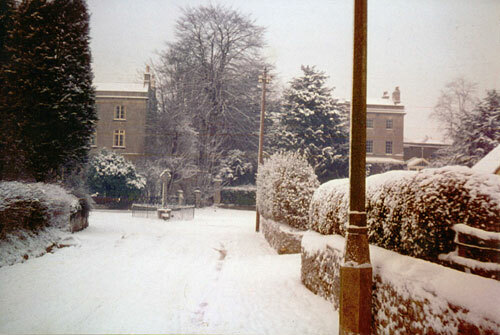 The school moved in 1962 to its present site in Claverton Road. centre of the High Street at the end of Beech Road. to the corner of Norman Rd/Beech Rd/High St.